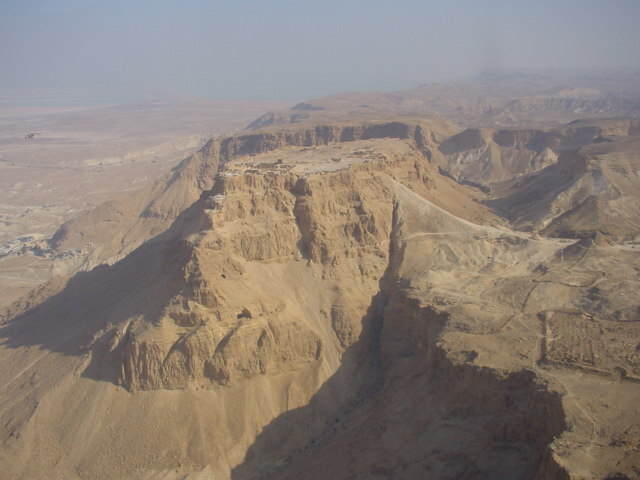 Mycroft Masada Holmes: ICTE / Keshet event “An Act Of Faith”! ICTE / Keshet event “An Act Of Faith”! 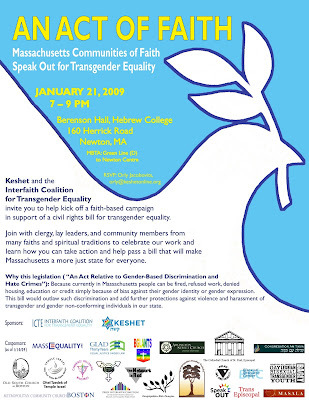 I’m a founding member of the Interfaith Coalition for Transgender Equality (ICTE) and Chair of Keshet’s Transgender Working Group (TWiG), and tonight we held an event called “An Act Of Faith (Massachusetts Communities Of Faith Speak Out For Transgender Equality)”. AAOF was actually the first interfaith transgender event in Massachusetts and perhaps beyond! How long overdue, and yet how timely. AAOF was the campaign 'kickoff' for ICTE’s and my primary work this year -- helping people and communities of faith support An Act Relative To Gender-Based Discrimination And Hate Crimes. That's the bill that we came close to passing last year; it would add "gender identity and expression" to the state's discrimination (housing, employment, education and credit) and hate crime laws. I and all other transgender people in Massachusetts would finally truly have civil rights (we still have them only in Boston, Cambridge and Northampton)! And everyone else's gender would finally be fully protected too. The bill was refiled on Wednesday, January 14th, in the Massachusetts House and Senate, and we plan to pass it into law this year. I was one of the two Event Co-Chairs and MCs (Masters of Ceremonies) – the other was Sean Delmore (Program Coordinator - LBGT@MIT; Candidate for Ordination – Deacon - United Methodist Church; Member - ICTE;). I’d never chaired or MCed an event before, but I couldn’t have had a better debut! The event was so wonderful and successful! I am so happy about it and hopeful about our work this year! I’ve never been prouder of ICTE, Keshet, and everyone else involved! AAOF literally meant the world to me as an interfaith transgender person and leader. We had a Welcome from Rabbi Daniel Judson (Director of Professional Development and Placement - Hebrew College Rabbinical School; Member – ICTE), Sean and I, Gunner Scott (Executive Director - Massachusetts Transgender Political Coalition), and Matthew O’Malley (Political Director – MassEquality). We had Songs from Judah-Abijah Dorrington (Chair - Boston Area Black Pride, Director of LGBTQI Programs - Wellesley College, Executive Director - People to People / Dorrington & Saunders Assoc.) -- Lift Every Voice And Sing and the Battle Hymn Of The Republic. We had a time called Planting A Seed – Judah spoke, as did Jennifer Levi (Director - Transgender Rights Project – GLAD). We had a time called Growing Roots -- Rev. Tiffany Steinwert (Pastor - Cambridge Welcoming Ministries - United Methodist Church), Reverend Father Toni Amato (Order of Saint John the Divine; Director & Founder - Write Here Write Now), and Marla Marcum (Co-Chair - Reconciling Ministries - New England United Methodist Church; Candidate for Ordination - Deacon; Member - ICTE) spoke, Rabbi Judson spoke again. We had a time called Branching Out -- Representative Denise Provost (Massachusetts House), Representative Carl Sciortino (Massachusetts House, co-sponsor of the bill), and Rev. Dr. Cameron Partridge (Priest - St. Luke's and St. Margaret's Episcopal Church; Founding Member - TransEpiscopal and ICTE) spoke. We had a Call To Action – a ritual in which attendees filled out commitment cards about how they would work to support the bill this year; the cards were printed as colored paper leaves and hung on a bare Tree Of Life until it was beautifully foliated. There was a Closing where Sean and I spoke again. And then there was “schmoozing” – refreshments, talking, photography and more. For the flyer as a PDF, click here. For the program as two PDFs, click here for the outside and click here for the inside. For my speech (given during the Welcome) as a Google (Word) Document, click here. For Ethan Jacobs’ Bay Windows article, click here. AAOF was also in the Keshet enewsletter, on the ICTE blog, and elsewhere. Ethan Halainen, Keshet Communications Assistant – for Keshet’s Flickr page of his AAOF photos, click here. Marilyn Humphries, Bay Windows photographer – for her Flickr page of AAOF photos, click here. Bill Wasserman, my father – for my Picasa Web album of his AAOF photos, click here. Thank you oh so much, ICTE, Keshet, our cosponsors, our speakers, and everyone else who worked on, attended and participated in this event!